Enjoying a holiday or even retiring to the Swiss Alps or the shores of Lake Geneva could be just the ticket for older people, new research suggests. 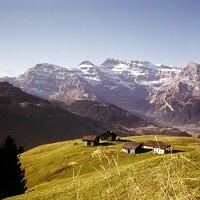 For Switzerland tops an index detailing the best places in the world for older people to live in. HelpAge International and researchers at the University of Southampton looked at the social and economic well-being of older people in a total of 96 countries. The factors they took into account included health, education, income, employment and the enabling environment. With a population of just over eight million, Switzerland is bordered by France, Germany, Austria, Italy and Liechtenstein. Its biggest cities include Zurich - one of the world's biggest financial centres and home to many banks - Geneva, Basel, Lausanne and Bern. The Global AgeWatch Index puts Norway in second place and Sweden in third. Germany, meanwhile, is ranked fourth with Canada said to be the fifth best place for older people to live. As well as the UK, the rest of the top 10 includes the US, Japan, Iceland and Holland - countries that holidaymakers can visit while covered by an older people's travel insurance policy. The index, propped up by Afghanistan, represents just over 900 million people aged 60 and above. Apart from Japan, the top 10 is comprised entirely of nations in Western Europe and North America. It is those in Japan who - at the age of 60 - have the longest life expectancy. People living there can expect to live another 26 years when they hit 60, compared to the average of another 21 years across all the countries studied. When it comes to poverty among older people, the highest rate (48.5%) is said to be in South Korea, followed by Venezuela, Australia, Bolivia and Honduras. More than half the countries in the lower reaches of the income and health rankings are African ones but, overall, the lowest ranking 25% include countries in every region. They include Greece, Venezuela and Turkey.